Visco shares her experience as a businesswoman and debunks myths that surround medical marijuana. Chris Visco shared her insight on success as a Cannabis dealer during her campus visit. Visco, the president of TerraVida Holistic Centers, talked about her unconventional business path as a marijuana dispenser. Visco offered students tips on running a business, and answered general cannabis questions. The Abeloff stage was lined with green artificial plants and a podium to welcome Visco and the attentive audience crowded the auditorium on March 6. Visco is the only female dispensary owner in the state of Pennsylvania. She says the industry is not used to dealing with strong business women. Before becoming a full time weed dealer, Visco wore many hats and held different job titles. Visco’s entrepreneurial transition began as a Boscov’s merchant to a David’s Bridal merchant to the “Queen of Cannabis”, now selling and buying cannabis. She also worked as a political strategist, so she has become familiar with the political campaigns, especially campaigns regarding cannabis. “It’s not that hard to teach a business person cannabis. Its’s really hard to teach a cannabis person business,” said Visco. She discussed the idea of women supporting other women within the business world. She also talked about making smart, yet risky business decisions. TerraVida employs 100 workers and is not regulated by the federal government. Visco explained although the federal government does not regulate TerraVida or the dispensary, the dispensary is required to pay taxes under the 280E Tax which, classifies as a drug cartel tax. “I’m Al Capone, but I’m paying my taxes,” said Visco. Visco currently has three medical dispensaries in Sellersville, Abington and Malvern. She says she would be considered “full disclosure” if the lieutenant governor legalized recreational marijuana. The legalization means Visco could potential open three recreational dispensaries. Medical marijuana requires patients to have a certified card from a licensed marijuana doctor. Recreational marijuana does not require a card, but is federally taxed between 15 and 30 percent. It is illegal for insurance companies to cover medical marijuana. All cannabis treatments are purchased with cash. In the state Colorado, both recreational and medical marijuana has made large amounts of revenue. The state earned $2 billion in recreational and $1 billion in medical. Pennsylvania has an approximate population of 13 million people. she said about two percent of the total population becomes medical marijuana patients. Students lined up to ask Visco question about her fascinating career. Many students left with a new understanding of cannabis and the world of business. 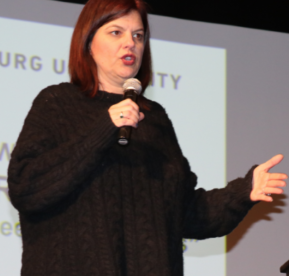 Visco, during the lecture, highlighted myths associated with the marijuana industry. She said people assume that all of her patients are 20-year-old “stoners”, but the reality is her average patient age is 58. By law, there is a limit per state of 50 dispensary licenses and 25 cannabis growers which have all been granted in the state of Pennsylvania. Visco said it is not required by law, but research is a priority. TerraVida is partnered with the University of Michigan to conduct research. The research helps keep safe and healthy products. she became familiar with marijuana at a young age. “I smoked a lot of pot when I was a teenager,” said Visco. She admitted she did not mind the idea of her children smoking. Visco discussed the many health benefits of cannabis, but also how she has seen the plant change lives. Cannabis is used to treat symptoms of cancer, Glaucoma, chronic pain and a number of other health issues. Her favorite strain to use is Pineapple Express for her headaches. She said TerraVida is not only a marijuana dispensary. The center spends time educating the community. The company takes time to build relationships with its patients, which contributes to the dispensary being the top seller in the state. Visco was happy to share her experiences and knowledge with the students. The students were intrigued by Viscos’s knowledge of cannabis and her success. Some students asked questions about interning at TerraVida, which Visco directed them to her company website. Visco said she wants to expand her business in the future as well as the legalization of recreational marijuana. She said she hopes to inspire someone to pursue success in the business world.